It is important to keep your teeth clean and healthy as it is vital for our wellbeing. We can’t deny the fact that we are surrounded by bacterias and we can’t do anything about it. But, we can change few things and reduce the chances of suffering from infections or bacterias. By following simple ways we can keep our teeth healthy and safe. 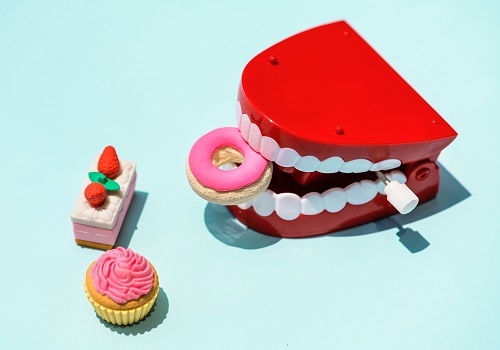 Good dental health is related to the overall general health and limiting an intake of sugar in daily life is one of the factors to keep healthy teeth. What and how often we eat plays an important role in maintaining dental hygiene and a healthy smile. Tooth decay is caused by the plaque which is a film of bacteria that coats the teeth. When you eat or drink anything then plaque bacteria digests the sugar and produces acid that attacks tooth enamel. Due to the stickiness of plaque acid stays in contact with the enamel after you are done with drinking or eating. The repetition of exposure to these acids results in caries or tooth decay. The more frequently you eat sugary food, faster the plague will form. Frequent snacking and limiting sugary beverages such as flavoured water, soda, juices etc. can help you maintain dental hygiene. Dentist recommends that in order to maintain dental hygiene one should brush their teeth twice a day. It is important to brush the teeth daily and remove the plaque to avoid dental problems such as gingivitis and tooth decay. If plaque is left on the teeth then it will form dental calculus that contains germs and can cause irritation in the gums. Along with brushing the teeth floss should also be used to clean between the teeth. If you keep your teeth and gums free of dental plaque then you are reducing the chances of any dental problem or any serious gum problem. To further reduce the chances of tooth decay, it is recommended to use fluoride. It is the most important ingredient present in the toothpaste and it plays a big role in reducing the chances of cavities and keeps your teeth healthy. Maintaining frequent visit to your dentist for complete oral examination is vital for the dental health. It is recommended that everyone should visit his or her dentist twice a year to avoid any risk of tooth decay. Your dentist can help you in treating your dental problem at an early an early stage. Your doctor will treat any tooth problem before it reaches it reaches the point of becoming serious gum diseases. Dealing with the problems at an early stage will not only save your teeth but in a long run, it saves you from pain, swelling and bleeding of gums. As if it left untreated then it can turn into severe gum disease which will be very painful. It is known to everyone that smoking is bad for health but do you know that it is one of the reasons for suffering from gum diseases. People who consume alcohol have a higher chance of suffering from diseases such as dental caries, gingivitis and sometimes it leads to the case of oral cancer. The salivary glands of excessive alcohol drinkers become swollen in a long run and alcoholics often deal with decayed teeth. Studies say that alcoholics suffer more from the condition of missing teeth as compared to non-alcoholics. Consumption of alcohol leads to dehydration and poor immunity which causes bacteria and plaque. High consumption of alcohol has a severe effect on oral health and can lead to a situation of causing oral cancer. Share it with your friends and family to spread awareness. How much you know about Wisdom Teeth? How to train your mind to hate junk?